Yesterday, around noon time, the Taguibo River Watershed Forest Reserve experienced heavy downpour of rain thereby causing high water turbidity in the Taguibo River forcing Butuan City Water District (BCWD) to temporarily suspend the operation of the Infiltration Gallery. 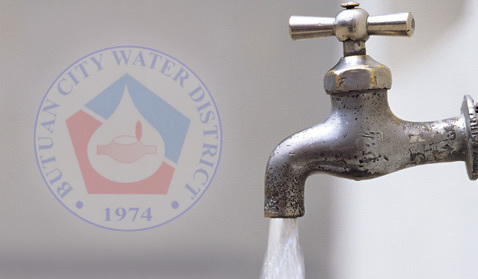 As such, the entire service area of BCWD experienced low water pressure while the end points of the system and those located in elevated areas are waterless. As of 11:00am, water pressure at Pump Station No. 1 is at 275.79 kPa (40 psi). BCWD personnel are still monitoring the status of the Taguibo River in the area. Since the Taguibo River is already very shallow brought about the El Niño, the turbidity level of the river is taking longer to lower down as such building up of water pressure will also take some time. With regards to the status of the Taguibo River as far as the El Niño Phenomenon is concerned, BCWD has been closely monitoring the effect of the prolonged dry condition. With the scattered rain showers the previous week, the water level of the Taguibo River remains far below the expected levels for this time of the year. Starting April 1 to 11, 2016, the water extracted from the Taguibo River is only half of the usual 1,200 cubic meters to 1,400 cubic meters per hour minimum volume extracted from the source by BCWD during normal conditions which is enough to cater to the demand of the concessionaires of BCWD. The five (5) pumping stations of BCWD have been operating 24/7 to augment the much needed water supply. However, the volume of water produced by the 5 pumping stations is only enough to cater to the demands of the BCWD concessionaires located at the Eastern side of Butuan City. The rest of the service area of BCWD still experiences low water pressure or waterless situation. To this end, BCWD encourages its concessionaires to conserve water or to minimize water consumption to be able to share what is left of the water supply during this El Niño Phenomenon. Rest assured that the District continues to find ways to be able to provide the needed water supply to its concessionaires. If the water level at the Taguibo River will reach its critical point, BCWD may then conduct water rationing to be able to continue providing water to its concessionaires.